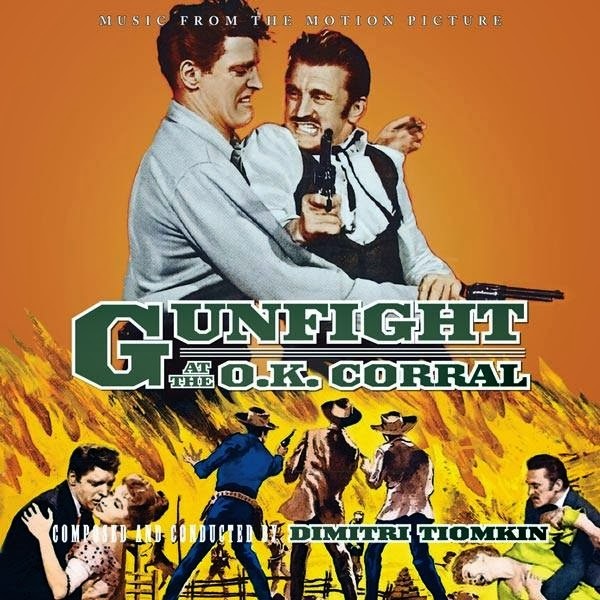 La-La Land Records and Paramount Pictures present the world premiere release of Dimitri Tiomkin’s original motion picture score to the 1957 Paramount Pictures western feature GUNFIGHT AT THE O.K. CORRAL, starring Burt Lancaster, Kirk Douglas and Joan Van Fleet, and directed by John Sturges. Legendary composer Dimitri Tiomkin’s (HIGH NOON, 55 DAYS AT PEKING, THE FALL OF THE ROMAN EMPIRE) classic western score finally makes its film version debut here, mastered from Paramount Pictures vault elements. The film score is presented in mono, with a stable of special bonus tracks, including source music tracks, demos and select stereo tracks. Also featured are the flim’s opening, closing and act break versions of “Gunfight at the O.K. Corral,” performed by the one-and-only Frankie Laine. Produced by Neil S. Bulk, executive produced by Lukas Kendall and mastered by Doug Schwartz, this long-overdue release of one of Tiomkin’s finest works contains exclusive, in-depth liner notes from film music writer Frank K. DeWald and pistol-slingin’ art design by Joe Sikoryak. This is a Limited Edition of 2000 Units.